Both fasting and stewardship are all too often brushed aside and held at a distance to practice at some point. Yet these two "holy habits" are far richer and more valuable than we often allow. Both call us to focus on doing God's will rather than our own, acknowledging the resources he has given us and responding in supplication and gratitude. Learn from Scripture and spiritual giants who have gone before us how fasting is part of the way we express our dependence on God, how being a steward is really about reflecting God's glory with our lives, and how integral these two spiritual practices are to the Christian's walk. 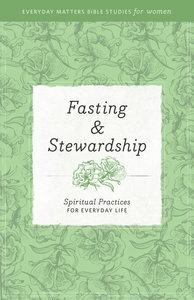 About "Fasting and Stewardship (Everyday Matters Bible Studies For Women Series)"